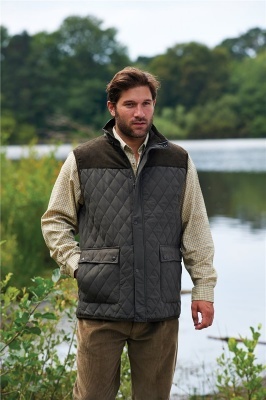 Mens Arundel Quilted Bodywarmer with Corduroy Shoulder Patches by Champion is the ideal country Gilet for a wide range of outdoor pursuits. Practical and Stylish the Mans Arundel Bodywarmer is packed with features including a full fleece lining for additional warmth, hard wearing corduroy shoulder patches, and a secure inside pocket. Full length zip with placket.